This squirrel cage trap is designed humane trapping of squirrels or similar sized pests. The bait is placed on or close to a plate inside the squirrel trap. When the intruder touches the plate, the squirrel trap is activated and doors are each end close trapping the animal inside. 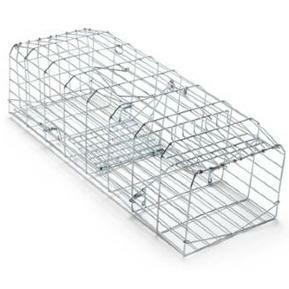 This squirrel cage trap is manufactured from galvanised steel to resist rust. Ready to use, no assembly required.